Metal or silver-colored braces are the most common type of orthodontic appliance recommended to patients today, and it’s what you most likely picture in your mind when someone mentions ‘braces’ to boot. While many adults assume that this time-tested technique is only for younger patients who are still in their junior high years, the truth is that any age can benefit from the improvements metal braces can create. In fact, they can transform your self-confidence, your smile’s ability to function, and your overall quality of life. At Cartwright Orthodontics, Dr. Gary Cartwright and the rest of our staff look forward to guiding you through the orthodontic process in a comfortable, modern office environment. We have two locations in McMurray, PA and Bethel Park, PA – contact us today to schedule a first consultation for you or your child! When it comes to traditional orthodontics, Dr. Cartwright will bond silver brackets to the front of your teeth in specific spots. Each bracket has edges (also known as “wings”) where elastic bands are tied in order to hold the archwire in place over the teeth. This archwire is what actually facilitates the movement of your teeth, applying consistent pressure over time that shifts them into the desired alignment. As patients progress through their personal treatment plan, Dr. Cartwright will need them to attend regular visits every 4 to 8 weeks. Why Should You Choose Metal Braces? Metal braces are highly durable, which makes them a good choice for accident-prone kids who may damage more fragile orthodontic solutions over time. 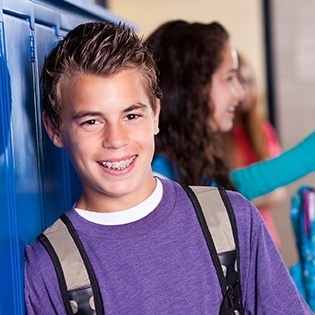 Many parents and adults appreciate the cost-effective nature of metal brackets. Because this system is widely used, the hardware associated with it tends to be more affordable than the advanced technology that makes up other kinds of braces. The elastics that fit around the brackets come in a wide variety of colors here at Cartwright Orthodontics, which is good news for your son or daughter! They can select their favorite color or a fun pattern that showcases their personality or the colors that represent their favorite sports teams. If you’re an older patient who would prefer a more neutral look, that’s not a problem either. White, gray, and silver elastics are always available too. Of course, it’s important to remember that traditional metal braces are going to be noticeable within the mouth throughout the course of treatment. 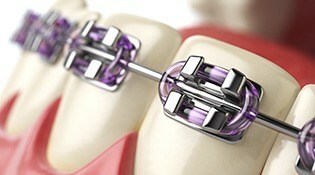 If a patient wants to prioritize aesthetics, ceramic braces may be a better choice for them. Our team will be happy to explore the benefits of these different options in full with you so that you can select the one that best fits your needs. What Should You Expect After Your Metal Braces Are In Place? You will likely experience some soreness and tenderness in the mouth in the first few days following the placement of your braces. We recommend that patients maintain a soft food diet until these sensations subside. Your mouth will also need time to adjust to the presence of your braces, and as a result, some sores may form on the oral tissue over the first few weeks of treatment. 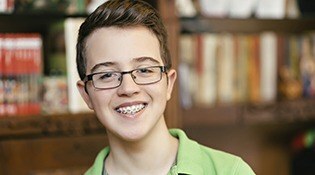 Please make sure to brush and floss diligently when wearing braces. There are now many more little spaces and grooves that harmful bacteria can gather in, and cavities can develop as a result. Also, make sure to follow the dietary restrictions that Dr. Cartwright provides you with. Hard or sticky food items can damage your teeth or your braces during this time, which we’d like to help you avoid, if at all possible.